His family hadn’t gone to the Winterfest Celebration looking for a puppy, but the second Robbie laid eyes on the young dog, he knew he had to have him. And it wasn’t just a matter of wanting; this dog belonged to Robbie. The boy knew it in his heart. He felt it in his soul. How to express this to his parents? That was the true dilemma. There had been so many things in the past that he had wanted, some obtained, some not, but so help him God this was different. To own this puppy, to be owned by it, was simply meant to be. Unlike the four-wheeler, the canoe, and his attempt at keeping chickens, Robbie’s very existence, his future peace of mind, was wrapped up in this dog. Rusty belonged to his parents before Robbie had been born. It was learning to walk while holding handfuls of Rusty’s wiry fur that instilled a love of animals, of dogs specifically, making Robbie even surer this puppy was meant for him and him alone. Besides, Rusty was on his way out. Robbie felt no guilt at this thought. He and the ancient Airedale had already discussed this matter while curled up on the couch. They had said their goodbyes, made their plans. Robbie knew Rusty would approve of this puppy. It would be a bridge across the gap of his grief on the day Rusty didn’t come when he called. What more could Robbie say? Robbie’s tongue tingled with the semi-forbidden word. He saw his parents milling their way back through the crowd. They hadn’t spotted him yet, still sitting with his puppy. Probably figured he had spent the day with his friends watching the men with chainsaws carve ice sculptures. The breeder’s question placed Robbie on the precipice between hope and despair. He had only moments to formulate the correct answer. His parents, with visible head shaking and exchanged looks, spied him kneeling on the straw, the husky pup straddling his legs. “Damn kid,” the breeder muttered. The breeder ran his hand across his stubbly chin, ending at the base of his throat where he scratched long and leisurely. His eyes cast heavenward. There are times in the lives of children when they experience the raw desire to possess something wonderful (a horse, an electric guitar) or do something fabulous (ballet lessons, white water rafting). More often than should occur, children must bypass these opportunities. Perhaps there’s no time, or worse, no money. Sometimes they’ve used up all their credit with the dreams they want to pursue. Parents insist that children exercise logic and reason in these circumstances. They probably say this in an effort to assuage their guilt especially when their own resources don’t allow for childhood dreams to be fulfilled. For Robbie Freeman, today was not that day. 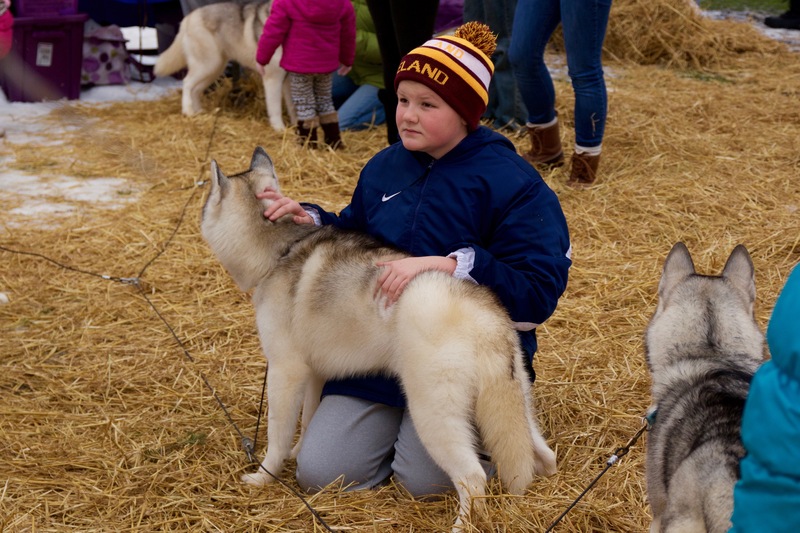 Thank you to HBSmithPhotography for the lovely picture of the young boy with the husky pup. Great story. Beautiful dog. Excellent photography. Loved this story. Really tugged at my heart strings. I espically liked the way you expressed Robby’s feelings about Rusty and the brief conversation between the child and the owner, the words left unsaid. As a reader, I could look at the story the way I wanted it to be, or I could look at it from the POV of a Higher Power looking over Robby. The description of how and why children get what the dream of/want, resonated with me. I so enjoy your posts. Thank you, Diana. It’s reviews like this that making writing all worth it. This story speaks a truth not always recognized by those who do not possess a deep love for animals. There is no doubt in my mind that the pup, the dealer, and Robbie were involved in a deep understanding of one another re possession of this living thing. Animals do convey their preferences and needs to those who listen. Kids want what they want. Some are caring and considerate of others as noted by an interaction between Robbie and Rusty. Parents and other adults look at the big picture giving weight to the practical but not without feelings for the here and now. Made clear by the interaction between Robbie and the breeder, the unspoken word and a glance heavenward speak volumes. How many times has the breeder been in this position? Your short story brings into light an intangible exchange of hope, acceptance and impact on all characters within a few moments on a cold afternoon. Compact. Concise. I love well done descriptive writing. Your writing makes your readers feel they are part of the story, right there in the space and moments that take place, watching.